April 11, 2011 - US Airways announced that up to 200 full-time jobs could be coming to its Winston-Salem, N.C. reservations center this year when the airline returns to the United States work currently handled outside of the U.S. That work will be moved to reservations centers in Winston-Salem, Phoenix and Reno, Nev.
As part of the airline?s agreement with the Communications Workers of America (CWA) and the International Brotherhood of Teamsters (IBT), which represent the airline?s more than 6,000 customer service employees and reservations agents, all positions supporting US Airways? sales and services calls originating in the United States will be brought to U.S. locations by October 2011. Chuck Allen, US Airways? director of government and community relations, said, ?Today?s announcement was facilitated by a number of entities, including the City of Winston-Salem, Winston-Salem Business Inc. and the Millennium Fund. These are our community partners, and US Airways is proud to serve as an affirmative corporate citizen of North Carolina.? Winston-Salem Mayor Allen Joines said, ?The creation of up to 200 jobs in the current economic environment is great news for Winston-Salem.? Ralph Womble, chairman of the Millennium Fund, said, ?The mission of the Millennium Fund is to look to enhance the future of Winston-Salem, while bringing us together. Since its inception, the Fund has reinvested over $50 million into the community. We are thrilled with the announcement of these new jobs, and I am delighted that the Millennium Fund was able to join with Winston-Salem Business Inc. and the City of Winston-Salem to assist in the expansion of this project.? 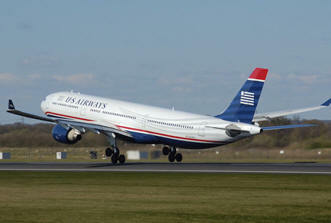 US Airways? Winston-Salem reservations center currently employs more than 700 people. The starting salary for the new jobs is nearly $21,000 per year, plus a highly competitive package of comprehensive medical and travel benefits. In addition to providing US Airways customers with a high level of service and support for their travel needs at the airline?s reservations center, many Winston-Salem employees participate in a variety of community-based projects through membership in the Winston-Salem chapter of the Do Crew, US Airways? employee volunteer corps. US Airways, along with US Airways Shuttle and US Airways Express, operates more than 3,200 flights per day and serves more than 200 communities in the U.S., Canada, Mexico, Europe, the Middle East, the Caribbean, Central and South America. The airline employs 32,000 aviation professionals worldwide and is a member of the Star Alliance network, which offers its customers 21,000 daily flights to 1,160 airports in 181 countries. Together with its US Airways Express partners, the airline serves approximately 80 million passengers each year and operates hubs in Charlotte, N.C., Philadelphia and Phoenix, and a focus city in Washington, D.C. at Ronald Reagan Washington National Airport. US Airways was the only airline included as one of the 50 best companies to work for in the U.S. by LATINA Style magazine?s 50 Report for 2010.